Federal Case sells to Robert and Lawana Low for $650,000 at the 2018 Keeneland November Breeding Stock Sale. Federal Case, a 2-year-old son of Gemologist who won his career debut in October at Keeneland, sold for $650,000 to West Bloodstock, agent for Robert and Lawana Low, to be the most expensive horse of Tuesday's ninth session of the Keeneland November Breeding Stock Sale. 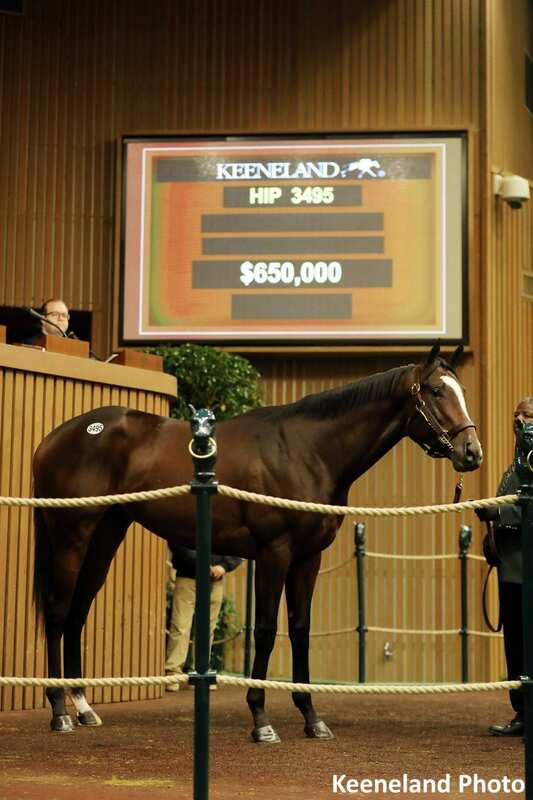 Keeneland sold 244 horses on Tuesday for $6,337,000 for an average of $25,971 and a median of $12,000. There are no comparable figures from 2017. Cumulatively through nine days of the sale, 2,049 horses have grossed $184,287,600 for an average of $89,940 and a median of $37,000. WinStar Racing, agent, consigned Federal Case, who is out of the Elusive Quality mare Delilahjane and from the family of Breeders' Cup Sprint winner Very Subtle and Grade 1 winner Pool Land. The colt, a graduate of Keeneland's 2017 September Yearling Sale, made his first start Oct. 19 at Keeneland, winning an about 7-furlong race by a half-length for owners WinStar Farm, China Horse Club and SF Racing and trainer Rodolphe Brisset. “It was hard to part with him because he won so well first time out, but all the smart guys were on him,” WinStar president, CEO and racing manager Elliott Walden said. “We put him in this sale in August. We hate scratching horses, so we felt like we should bring him. Jacob West, who signed the ticket for Federal Case, said the colt would continue his racing career for trainer Todd Pletcher. With the purchase of Federal Case, the colt's new owners were the day's leading buyers. WinStar Racing, agent, led all consignors, selling 12 horses for $1,115,000. At $230,000, the day's second high seller is Lady Suebee, a 3-year-old, stakes-placed daughter of First Defence sold to Ingordo Bloodstock. Consigned by Elite as a racing or broodmare prospect, Lady Suebee is out of the stakes-winning Touch Gold mare Freeroll and from the family of Canadian Horse of the Year Izvestia. WinStar also sold She Will Rock, a 2-year-old filly by Will Take Charge, for $200,000 to Rosilyn Polan. Out of the Storm Cat mare Whichwaydidshego, She Will Rock is a half-sister to stakes winners Mark My Way, Hard to Stay Notgo and Haul Anchor and from the family of Grade 1 winner Joking and Grade 2 winners and sires Fed Biz and Tale of the Cat. Two weanling colts brought $90,000 apiece. Machmer Hall purchased the first, a son of Speightster out of the Maria's Mon mare Bear's Lightning and from the family of Grade 1 winners Overanalyze and Meadow Breeze. He was consigned by Ledgelands, agent. Fred M. Allor paid $90,000 for a son of Kitten's Joy who is a half-brother to stakes winner Five Iron. Consigned by Taylor Made Sales Agency, agent, he is out of the Thunder Gulch mare Tee Off and from the family of Grade 1 winners Only Queens and Tactile. The November Sale continues through Friday with all sessions beginning at 10 a.m. Eastern. This entry was posted in Bloodstock, NL List and tagged Bear's Lightning, china horse club, Delilahjane, elite sales, elliott walden, Federal Case, first defence, gemologist, horse auctions, Ingordo Bloodstock, jacob west, keeneland november breeding stock sale, Lady Suebee, machmer hall, Robert and Lawana Low, Rosilyn Polan, sf bloodstock, She Will Rock, speightster, todd pletcher, winstar farm, WinStar Racing by Press Release. Bookmark the permalink.